I got this idea from a friend of mine recently when we were discussing how I usually purchased canned beans to put in recipes, when the entire meal isn't going to be based around beans. I try to be careful when buying beans because so many of the manufacturers are putting extra ingredients like corn syrup and high fructose corn syrup. Yuck! In my beans?? No thanks! Melissa said that when she makes a pot of beans she will take the extras and put a cup of them (which happens to be the size of my ladle) into one of the disposable red cups. She then freezes them. When they are completely frozen she removes them and puts them into a gallon zip-lock bag for later use. I learned you need to run the cup under warm water for a few seconds to release the beans. Don't forget to wash and reuse your plastic cups for more beans. This might be old news to most of you, but it was like a lightbulb moment for me. The thought of soaking and cooking a cup of beans was preposterous! This I can do - and I did! I usually make a plate for Big P that we put in the freezer for a lunch, but I always have lots of beans left - always! Beans are more than the musical fruit, they are cheap and good eats! My friend Raye Ann, has great ideas for doing lots of different things with beans that are super cheap! Basically any flavor of bean you want, you can add in a tablespoon or two of seasoning. The other day when we had pinto beans, I made them kind of "southwest-ish" by throwing in 2 tbsp. of a steak seasoning that we get from our local Mennonite bakery. It ended up being a little too pica (spicy hot) for my little guys. They would eat it like crazy, stop to drink water or milk, and resume! Here's to making up a big pot of beans and freezing the leftovers *ching ching*! That could be money dropping into your savings jar or your toasting glasses chiming. So, in an effort to simplify birthdays around here and make each person's birthday extra special, we have come up with a couple of ideas; either learned from someone else, or more recently, thought up on our very own. A few months ago I found the perfect cake pan for everyone's birthday! I was really hesitant to buy it, because it was $30!!! But, I started thinking that if we used it 7 times in the first year, that was under $5 per person. Using it for 2 years makes it under $2.50 per person and... You get the idea. This will become our new family tradition and I'll have to look on ebay in 20 years to find all my daughters-in-law one of these cake pans because my sons will want them to continue the tradition. My one and only daughter, P10, will, of course, get the original cake pan. So, instead of being at the mercy of the local convenient store and their supply of snowballs (a tradition we had growing up and one I've kept), we will now have a "cupcake" cake. Each child (or adult) will get to choose their favorite flavor of cake and icing. I'm most definitely using boxed cake mixes and canned icing! Not feeling guilty about it either. I also picked up a roll of Happy Birthday wrapping paper and a bow tonight. Yes, a (as in 1) bow. It's one of those really nice ribbony ones. I won't even use the peel off self adhesive tab. I'll use tape and stick it on top of the child's gift. It will be recycled. We only give one gift for birthdays anyway. I'm not going planning to reuse the paper! Each child also gets to chose their birthday breakfast, birthday lunch, and birthday dinner!! For breakfast, most of the time they choose biscuits and chocolate gravy, since we rarely ever have that, except for birthdays. You don't get the day off school on your birthday, but we may institute that at some point. Also, my older ones have enjoyed having friends over for the day or afternoon in the last few years where we make homemade pizza and they hang out. Hope this is helpful. I thought I'd blog about it while it was fresh on my mind as we have the busy birthday season coming up! C will be 14 in January, L will be 4 in February, B will be 6 in March, I will be 25 again 33 in April, A will be 2 in April, P will be 11 in May, and Big P will be 38 in June! Hope that non-stick finish can keep up with us! Praising God for all these blessings to bake for! This was the basis for the sermon this beautiful, cold Sunday morning. Oh, I love our church. One reason is that you never get to walk away empty handed. Pastor Drake always has a meaty service planned and has continued so, even in the midst of his knee surgery and recovery. This morning was no exception and was FULL of Scripture to open our eyes, that daily we must refocus on God and live every minute for Him. As I mentioned before, I easily get distracted. Realizing that God has called me to be a multi-faceted kind of woman, I need to make sure that those various areas are glorifying Him. So, in order to not get distracted, to stay on course, I need to make a plan that I can stick to; a plan of variety. It all came together for me this morning, having started last night when I was reading one of Brandi's posts on her goals for the year. Taking the 7 days of the week (our God is a God of order!) and the 7 areas that He has assigned to me, I will have one area each day that I focus on learning and growing. I will have a reading resource of some sort (ebook, physical book, e-zine, etc.) that I set up on the nightstand. Each night I will read my assigned pages. These are goals and not set in stone. If I'm reading really deep stuff, I don't want to be forced to read 10 pages when I was getting overwhelmed at 6. Sometimes what I read doesn't necessarily fall into a particular category, though. Like when I read the Duggar's book, I didn't get bogged down, but it covered almost all my categories. Don't have a plan what I would do in that case in the future, yet. Many times people believe that God doesn't care about a particular part of their life. They separate their life into God's area, Work, Home, and Me. Really, God wants to be in EVERY area! It is because of this that I'm particularly careful about what I read in every area and make sure that it is from a Christian worldview. There are some instances that this may not be able to be achieved, but I have found it rare. God is the author of marriage, parenthood, health and homeschooling. I've even found some of the best resources in organization, finances, and homesteading to be written with a Biblical worldview. These are the areas that I will be setting my goals in, too! And all of them based on what God wants for me to be doing in each area - not what I think is best. Blend everything (except ice) super super good then add ice and reblend. You could prep your cocoa, coffee, & stevia the night before. Pull out your honey & vanilla too. Don't grind your flax until right before you use it - you could put it in the coffee grinder and have it ready. Just prepare everything you can to aid in quickly putting it together in the morning. It is incredibly yummy and could really curb your desire to run to starbucks for a $5 coffee. If you have big financial goals, like we do this year, that will help. ~update~ It is possible to put too much spinach in this smoothie! Blend the heck out of everything, except the strawberries. Add the strawberries in last and blend again until smooth. You'll want a thick straw, because this is a thick smoothie. Makes a quart that is very filling! Also gets in 4 servings of fruits and veggies, plus your raw nuts and coconut fatty goodness! Decluttering...That's one of the many modes I'm in currently, and one of my strongest goals for 2010. Here's a great post on the subject from Simple Mom. I'm a pile maker myself. I'm loving this blog. 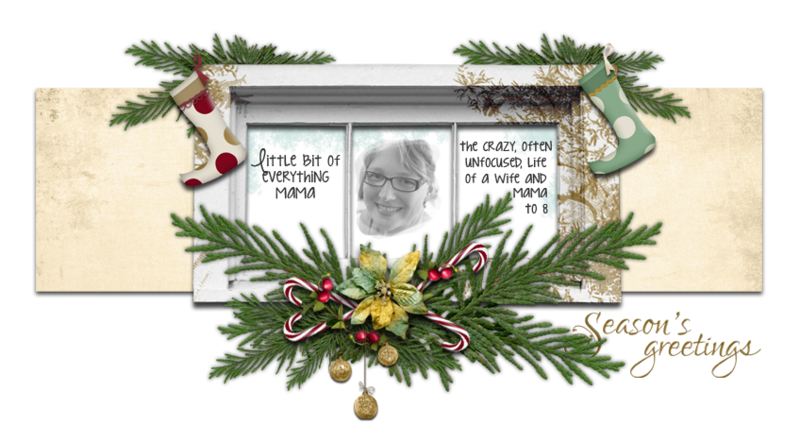 It's kind of ironic, because I want to be simple and have even threatened to be a minimalist, and yet my blog is Little Bit of Everything Mama, which suits me very well. Maybe I'll try to find a middle ground this year. And another good post from Simple Mom. None of this was new information to me, but was a reminder that I need to apply to what actually comes into my home, instead of just what I have currently. Aha, just the thing I was looking for. Keeping Your Home Clutter-Free! Currently I'm in the "was breakfast nook - then prayer room - now gym". I've cleaned off the buffet and cleaned it out as well. Just have a few things on the top and it will be clutter-free. I'm so tempted to put something on top of it just to keep it clutter free. Maybe I'll seek out one of those mail organizers or a basket to house things that are going out of the house. I also decluttered the game closet, went through all the games, relocated them, and am now using that space for our bulk toilet paper, paper towels, soaps and cleaners. Another tactic we are implementing is this labeled box/card system that I read about in Jim-Bob and Michelle Duggar's book "Duggars: 20 and Counting". (here's one of those side notes: This is an incredible book of living a life for God's glory and raising children to do the same). She properly credits Emily Barnes' book Survival for Busy Women, for the idea. When we were on our way home from our annual Christmas camping trip, I told Big P my plan. Later that afternoon I went to Walmart for the supplies and yesterday I started in on my plan. It's going good, but I better get back to it! Happy New Year everyone! Are you excited to see what the Lord has in store for you this year? Are you ready to put your own plans away and follow Him? This year I've learned more about myself than I ever have in my life. 2009 has been a great year for me, but it hasn't been easy. In certain ways it's been my hardest year yet. Through seeking God and learning more about Him, I've learned my strengths, but also many of my weaknesses. I've learned where I try to take the reigns and don't trust Him fully, and I found grace in His arms as I've repented for those sins. What I think I've learned a big lesson in is that I don't know anything that I haven't learned from someone else. My children will come to me with some new fact or tiddle and I'll ask where they learned it. Most of the time they can tell me, whether it is in one of their textbooks, a book they read in their spare time, or from a friend at church. The other day, P10, explained to me that she didn't really "learn" it anywhere, but that she figured it out and used deductive reasoning (my words, not hers. LOL) I laughed at the cuteness of it - although I didn't call it "cute", because she's pretty much over that word now. It reminded me of all the times my mom would ask me where I learned something and I just "knew" it. But really I had learned it somewhere. So, I've decided that for the next year, the focus of my blog will just be to learn from others and pass on what I learn via links to other blogs, articles, and resources. I might add in my own "side note" now and then, but for the most part, I'll just be pointing those that read my blog to other blogs where I'm learning and, by God's grace, growing. Anyone who knows me knows that I'm sort of flighty. I'm blonde, but I'm not ditzy - just flighty. It's that creative side of me. But it needs to be harnessed! I need to learn to stick something out, to follow through - I need to be diligent!! So, this will also be a way for me to have some accountability. I need to talk less and listen more. I need to teach less and learn more. In learning, I will be teaching just by my very nature of excitement to pass on things that I learn and am involved in. I love order, but can't promise that everything will be on topic - although that is an area that I'm going to work on. See, in my mind, most things just kind of swirl together like the steam off a fresh cup of coffee. They mix and mingle to bring forth an amazing aroma of mixed up ideas that make sense to me; but probably only me! There ya go! That's my focus in a nutshell and just some of the tidbits that God has taught me this year.